lovedog ranch: My first quilt! If you remember, (as I'm sure you do because of course you mentally catalogue all of my posts), I am in the process of making my first quilt. 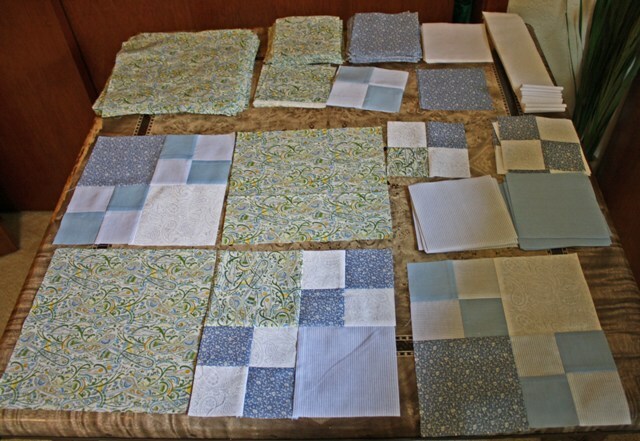 I had no idea how many (meticulous) steps are involved in making a quilt. I will say this is by no means a tutorial. 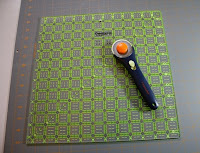 Traditional quilting is a six-step process that includes: 1) selecting a pattern, fabrics, and batting; 2) measuring and cutting fabrics to the correct size to make blocks from the pattern; 3) piecing (sewing cut pieces of fabric together) blocks together to make a finished "top"; 4) layering the quilt top with batting and backing, to make a "quilt sandwich"; 5) quilting through all layers of the quilt sandwich; and 6) squaring up and trimming excess batting from the edges, sewing the binding to the front edges of the quilt and then stitching the binding to the quilt backing. Here are a few notes on the process. - One 12.5" x 12.5" cutting square. 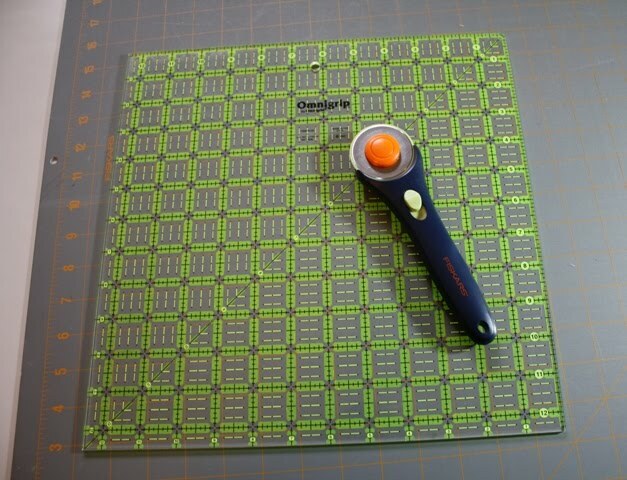 This size is great for large strip cutting, and checking your squares. - One trusty sewing machine that makes an exact 1/4" seam with the presser foot. This is important for sewing accurate seams, so that your blocks line up throughout the process, and in the assembly stage. - A pattern to follow. This is something I didn't think was entirely necessary. 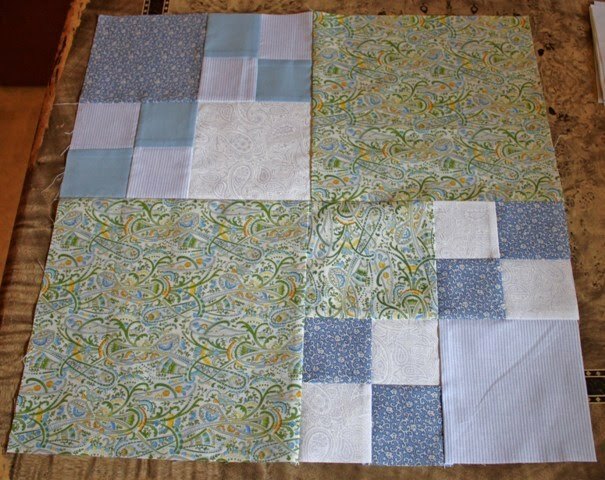 I thought I would make a random patchwork quilt. But I found an easy pattern to modify and it has been SO useful in determining how much of each fabric I need, how many squares of each size, how to lay it out, etc. - Someone who knows how to make a quilt. I have learned so much on every step of the process from my teacher, Justin's step-mom, Diann. From proper cutting techniques, to ironing/setting the stitches, graphing the layout, and all the shortcuts, it makes me wish I had taken better notes. I predict I she will be on speed dial for my second quilt too. On my quilt, I'm currently on steps two and three of the six step process. I've put about 20 hours into it so far (which includes shopping/selecting the fabrics). 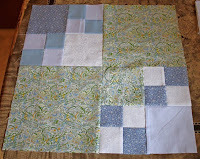 These are some of my cut squares, with a few of the smaller squares sewn together. Below is my first assembled large block. My finished quilt will be five large blocks wide, and five long, plus a thin and thick border around the outside. So far I have really enjoyed the process. It was sort of intimidating knowing once I began, there would be a LOT of hours until completion, but it's been rewarding to see each of the blocks come together. It can be tedious (cutting the strips and squares, sewing, sewing, sewing) but it's also relaxing. I think I actually enjoy the repetition at times. I definitely think you need to like sewing, which I do. Already my sewing techniques have improved a ton which was one of my major goals in this project. I'll update you later on with the quilt's progress. In the meantime, recipes, quick crafts, and other projects forthcoming! Awesome job, Brooke! I keep on keepin' on with my own little projects and have yet to try quilting. I am scared that I will spend every penny on fabric because I do so love to just walk around the fabric store looking at every little pattern.